As the end of the year approaches, we once again find ourselves dreading the paper pushing and number crunching of tax season. But, let’s not forget the excitement that comes with getting back some of your own hard-earned money in the form of a tax refund. Saving a portion of your tax refund can be a big step toward meeting your savings goals, so it’s no surprise that a 2015 tax season survey found that a majority of those who receive a refund planned to save it. · Use Form 8888 to split your refund. Entry to win with SaveYourRefund starts with splitting your refund into savings. · Save $50 or more of your tax refund. In order to enter, use Form 8888 to save at least $50. There are a number of accounts you can save into including a savings account, a U.S. Treasury Direct account (savings bond), and a myRA retirement account. · Visit SaveYourRefund.com to enter. You will be automatically eligible to win one of ten $100 prizes that will be given away every week from the start of the contest until the end of tax season. · Upload a picture here that represents your savings goal or motivation, and you’ll be entered to win the $25,000 grand prize! Need tax assistance? Take advantage of a Volunteer Income Tax Assistance (VITA) program. VITA programs offer free tax help to those who generally make $53,000 or less, persons with disabilities, the elderly, and limited English speakers. Get ahead of your financial goals by splitting your tax refund into savings, and reward yourself with SaveYourRefund. Virginia Beach Human Services Department will have volunteer tax assistance on February 11, 12, 25 and 26 from 1:00 - 5:00 pm. Walk-ins are welcome, but if you need an appointment, just call 757-385-3551. Free tax preparation for households earning $55,000 or less. www.shreitc.com for a list of locations available to serve you! 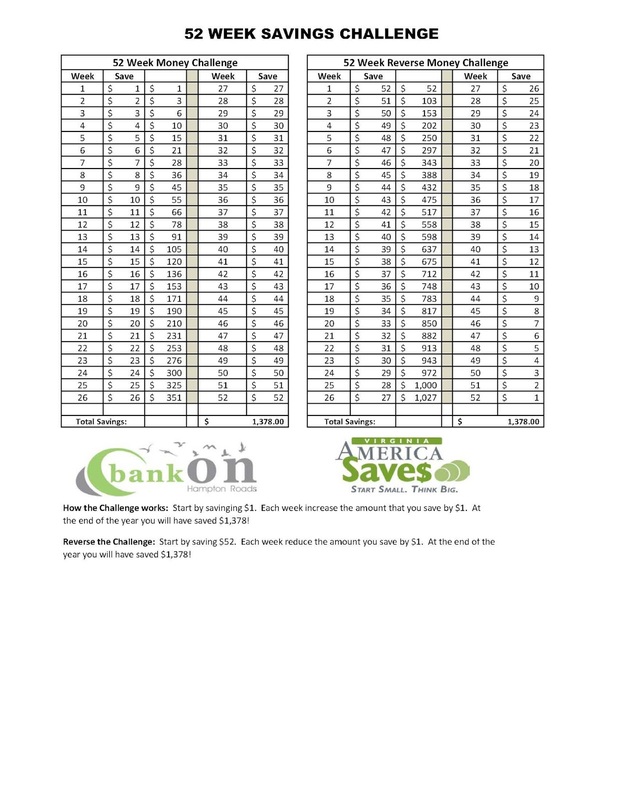 Take the savings challenge and see if you can grow your savings week by week with the 52 - week savings challenge. Try it forward or in reverse. 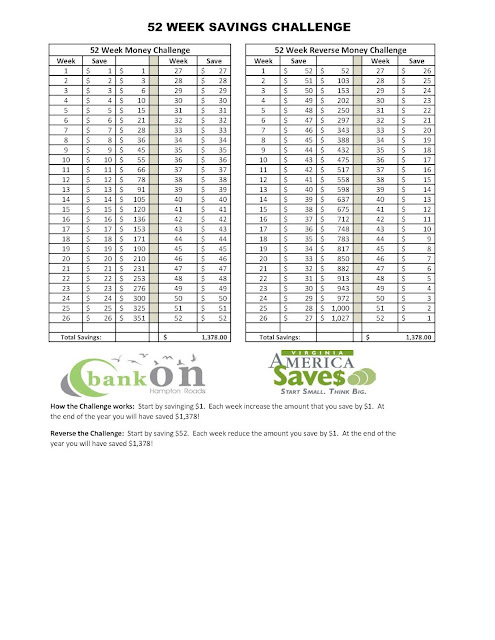 To reverse the challenge use your tax refund to jump start the larger months and then continue saving through the year each week a lesser amount!